It sounds nonsensical, but it’s true. Many people and families living in rental apartments in New Hampshire would be financially better off buying a low-cost home. 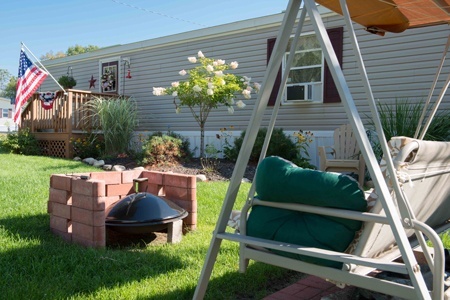 Our experience writing mortgages for manufactured homes (sometimes called mobile homes) certainly bears that out. One recent borrower bought a home in Raymond, N.H. and lowered her monthly housing costs from $1,332 to $944, saving $388 every month. Another couple bought a manufactured home in a resident-owned community in Newmarket, N.H. and lowered their monthly housing costs from $1,324 to $767, even after including the fee homeowners pay to the cooperative for use of the land. They now save a whopping $588 every month. So, if people can save money while buying a slice of the American Dream, what’s stopping them? For many, it’s the down payment. Zillow, the online real estate and rental marketplace, recently released the results of its first Housing Aspirations Report. Two-thirds of the renters surveyed said saving for a down payment was the biggest barrier to homeownership—bigger than qualifying for a mortgage, bigger than job security, bigger than concerns about debt. How can that be? The high cost of renting can drain savings people could otherwise use to buy a more-affordable home. Last year, $3.50 of every $10 earned by renters in New Hampshire went to their landlords. The New Hampshire Community Loan Fund exists to serve low- and moderate-income people and families. To make already-affordable manufactured homes even more affordable, we require only a 5% down payment—as opposed to the industry standard 20%. Most of it can come from the seller or gifts (like from parents). Yet, even when homebuyers need to come up with only 2% down, many can’t do it. And these are people whose income and expenses would otherwise allow them to afford and maintain a home. For these renters, we recently created Your Turn homebuyer assistance. Households that qualify as low-income (example: a two-person household with total earnings under $53,200-$62,550, depending on which N.H. county you live in) and are approved for our Welcome Home Loans may be able to get loans that cover down payment and closing costs. Your Turn loans act like an extension of the mortgage loan; borrowers start to pay it down only when the mortgage is paid off, or the home is sold. People hoping to live in Carroll County can receive up to $30,000 that they don’t need to repay to buy a manufactured home and place it in Ossipee Mountains Estates, a resident-owned community. We can’t guarantee that this assistance will be available after this homebuying season, so if you know a renter who wants to own a home, tell them Your Turn might make it their turn. Jennifer Hopkins is the Single-Family Housing Program Manager at the Community Loan Fund. NMLS #395262. The fine print: Welcome Home Loans carry a fixed interest rate; the current rate is 8.875% (Annual Percentage Rate of 8.953% with a $100,000 loan amount, $5,000 down payment, 30-year term, no points). Your actual rate, payment, and costs could be higher. Get an official loan estimate before choosing a loan. New Hampshire Community Loan Fund, Inc. NMLS #253893. Licensed by the New Hampshire Banking Department.